The Little Falls Urban Renewal Agency was established by a special act of the Legislature of the State of New York in 1963. The Urban Renewal Exhibit chronicles the changes from the 1950s and 1960s throughout Little Falls, including Main Street, spurred by the community’s urban renewal initiatives. 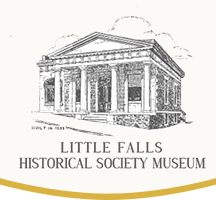 Visit the Little Falls Historical Society Museum to see how Main Street, and the city, has changed during the 1950’s and 1960’s. The Urban Renewal Exhibit features the names and some photographs of businesses that were found along the city’s Main Street prior to the urban renewal project of the mid-1960s and early 1970s. Louis Baum, of the Little Falls Historical Society, said the display lays out block by block what visitors would have found along the street before urban renewal. City officials wanted a Thruway interchange for Little Falls and agreed to allow the state to put state Route 5 through the city in order to get that interchange, Baum said. The project took out the south side of Main Street as well as buildings on the south side of the city. Hundreds of housing units and other structures were demolished, displacing several thousand people and more than 100 businesses. “There was no good plan to relocate people,” said Baum. Many were unable to find housing in Little Falls and left the city. The 1833 former bank building that houses the Little Falls Historical Society Museum would have been lost as well — torn down to make room for 14 parking spaces, according to Baum — but because it was on the National Historic Register, the court ruled it could not be demolished. Baum presented a program recently titled “Urban Renewal: Good, Bad or Both” and noted that the city has worked since that time to make the best of what it has with its festivals, such as the Cheese Festival and Garlic Festival, and Third Thursday events.